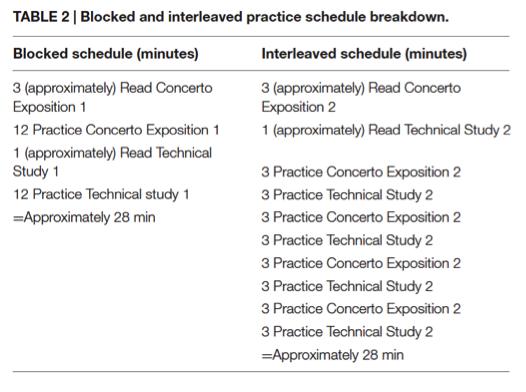 This study examined the effects of interleaved and blocked practice schedules on advanced clarinet performances in a realistic practice environment. A blocked practice schedule is one in which one task is completed before moving onto the next task, while an interleaved schedule involves alternating between tasks. A large body of research has found that interleaved practice often results in better long-term results; this is called the “contextual interference effect”. Although it has been observed across a variety of fields, research on the contextual interference effect in music is limited. Elaborative-processing hypothesis: different tasks being practiced together reside in the working memory together, allowing them to be compared and contrasted and ultimately, encoded more elaborately. Forgetting reconstruction hypothesis: switching between tasks induces forgetting of the previous task’s action plan. The reconstruction of the action plan results in a stronger memory representation. ​Ten skilled clarinetists participated in this study. The clarinetists were asked to practice a concerto piece and a technical exercise piece for each practice style, blocked and interleaved, for a total of four pieces. ​Day 1: Each participant first sight read each piece before practice (sight-reading trial). Then each participant practiced using the Blocked schedule and the Interleaved schedule consecutively. Immediately after practicing, the clarinetists performed the 4 pieces for a recording device, which provided the measure of immediate practice retention (acquisition trial). Day 2: Each participant performed the pieces again the next day (retention trial). Scoring: Three professional musicians assessed overall performance improvement, as would take place in a typical music jury or competition. They compared the sight-reading, acquisition trial, and retention trial for each song for each participant. ​The ratings provided by rater 1 and rater 3 indicate a marginally significant advantage using interleaving for technical exercises and a significant advantage using it for the concerto expositions respectively. ​Rater 1 rated the technical performance in the interleaved condition as better. The interleaved schedule also produced greater improvements when the scores were averaged, although not enough to reach statistical significance. The results of this study, while modest in size, do suggest that an interleaved schedule may be a viable alternative to a blocked schedule in the practice room. Further research, including more practice sessions and participants, would help establish the basis for a broad application of interleaved practice schedules in music. The questionnaires also indicated that the majority of participants found the interleaved practice schedule to be more useful. However, they still preferred the blocked schedule. Blocked practice is often favoured because it increases feelings of fluency after repetition, which can have a powerful impact over judgments of learning, regardless of how much learning has taken place. In order for contextual interference to be adopted, the repeat-until-perfect paradigm will need to be renounced in favour of a model that embraces challenge as a long-term performance enhancement strategy, despite limited instant gratification.